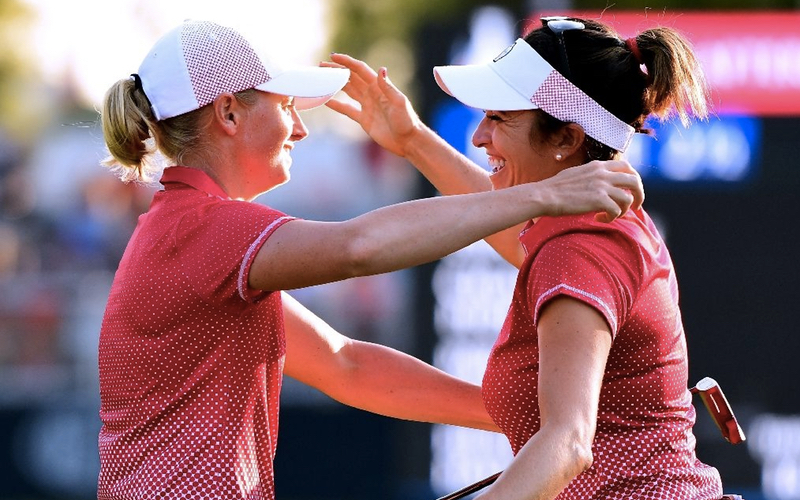 Stacy Lewis and Gerina Piller finished it off with a 2 & 1 victory over Charley Hull and Georgia Hall -- both of England -- the tightest match of the afternoon. Hull chipped in at the 15th to put some late pressure on the Americans, but Lewis rolled in a birdie putt at 17 to finish it. Angel Yin and Lizette Salas thumped Spain's Carlota Ciganda and Denmark's Emily Pedersen 6 & 5. Michelle Wie and Danielle Kang beat Sweden's Madelene Sagstrom and England's Jodi Ewart Shadoff 3 & 1. Brittany Lincicome and Brittany Lang beat Florentyna Parker of England and Germany's Caroline Masson 3 & 2. The United States, captained by Juli Inkster, are defending the title they won with a thrilling final-day charge in 2015. "I kind of switched my lineup a little bit in the afternoon," said Inkster. "I thought my afternoon matches, they played amazing golf, inspired golf. "They played with a lot of pride and a lot of heart. And we got up early and I think that really helped." Salas and Solhiem Cup newcomer Kang produced the United States' only win of the morning foursomes, beating Ciganda and Masson 1 up before going on to win again with different partners. Kang thrived in the more rowdy atmosphere of the team competition, clearly enjoying the enthusiasm of the galleries. But the visitors gained the first advantage. Scotland's Catriona Matthew, pressed into action when Norwegian Suzann Pettersen withdrew from the European team on Wednesday with a back injury, teamed with France's Karine Icher for a 1 up foursomes win over Lewis and Piller. "I was super nervous at the start but I always enjoy this event," said the 47-year-old Matthew, who now has 20 Solheim Cup points on her resume. "It doesn't matter how many of these you play in, you are always going to be nervous but I managed to get over that." Icher's hot putter was a big help. She drained a 40-footer for birdie at the 13th that cut the US lead in their match to 1 up and her birdie at the 14th squared the match. She and Matthew took their first lead at the 16th hole, Icher sinking the short par putt to take the hole. In other morning results, Sweden's Anna Nordqvist and Hall never trailed en route to a 3 & 1 victory over Paula Creamer and Austin Ernst. The English duo of Mel Reid and Hull halved their match with Cristie Kerr and Lexi Thompson. European captain Annika Sorenstam said Friday is just a taste of what they can do. "It's going to be a challenge the whole way," she said. "And I can tell you the spirit has not died down. I think, on the contrary, we're fired up. If they can do it; we can do it. So going to go home, take a shower, regroup and get some good sleep and be ready for tomorrow."